Plaswood Blinds or also known as Faux wood gives you that real wooden blinds look with added durability at a lower price. Ideal for rooms and areas with high heat and humidity. Even the word “plaswood” hints at something special doesn’t it? If wooden blinds and plastic blinds had a baby, plaswood blinds would be it! 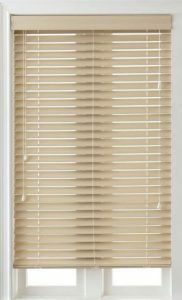 These blinds have all the best qualities of wood and plastic making them a fantastic choice when shopping for your blinds at Blinds Direct. Plaswood is a hybrid composite material which combines both plastic and wood. It really is a technological breakthrough in the blinds industry which is quickly gaining popularity. They look and feel exactly like wooden blinds with its textures and stains but they possess none of wood’s weaknesses. Well, most people searching for blinds are going to adore the wooden variety. They are warm, textured, versatile and have a beautiful luxurious look which complements any office or home. However, there are two problems with this. Wooden blinds are generally quite pricey and they don’t react well to heat, humidity and extreme light. Yes, plaswood blinds were actually developed and made in South Africa to suit the often harsh and contrasting South African climate. This means that humidity, and extreme light and heat has absolutely no effect on them. So even if you decide to go with wood blinds in your bedrooms and living areas, you should know that they are not suitable for spaces which experience humid conditions. Therefore, you would have to make another plan in your kitchen and bathrooms. Faux / Plaswood blinds work perfectly in these environments. If you have ever looked at wood blinds you will know that they can be pretty expensive. Plaswood Blinds is a much more affordable material. Therefore, not only do you get the luxurious look of wood in the form of a more resistant material; but you also pay less for it! Win-win. Due to the durable nature of plaswood, you needn’t worry about wiping these blinds down with a wet cloth. Cleaning in this nature will not cause the blinds any damage at all. The slats are easily accessed for dusting and wiping. 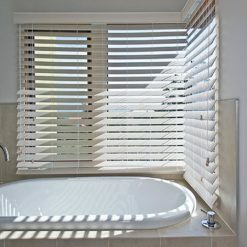 Blinds Direct have a variety of styles on offer when it comes to plaswood blinds. This makes it easy to choose a colour and texture to suit your specific space. Enter your measurements online and your custom blinds will be delivered to you!